After putting Possum to bed tonight I did a quick weather check, you know, to see if it might snow. No snow forecast but it did say that the apparent temperature was -7!!! If that’s not deserving of a good dump of snow I don’t know what is! It is definitely deserving of a toasty wood fire. Living up here in the Blue Mountains has meant I am pretty nifty with the ol’ fire building. No firestarters here! I’m also very fortunate to be living across from bush where there is no shortage of kindling and fallen branches to get the fire started. Legoman has introduced me to a very cool little flick saw, which means I don’t have to risk breaking a leg trying to jump on branches to break them either! Huzzah! Alas, the amazing fire couldn’t be shared for dinner. Legoman needed to work late and I had used up all my enthusiasm making a cranking fire. 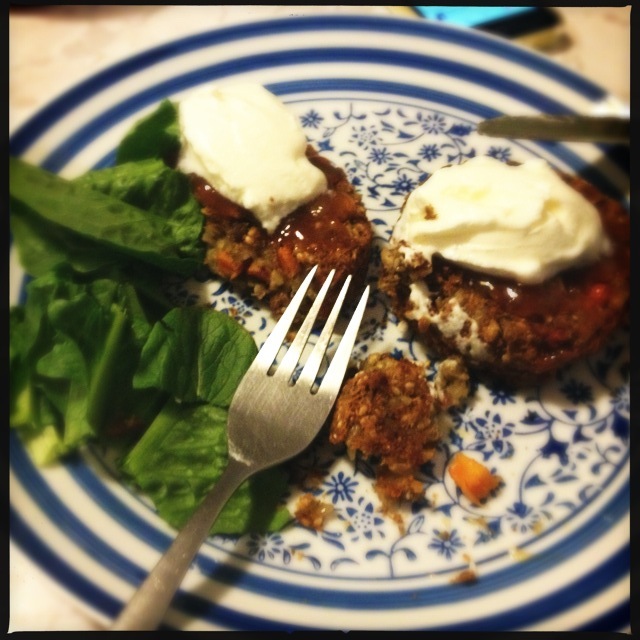 So instead of serving myself up some salmon as was planned tonight, I grabbed a couple of lentil burgers out of the freezer and dished them up with mango chutney, yoghurt and a few lettuce leaves. Simple but pretty darn tasty! Affordability : Moderate. No more than $5 for the serve. I did buy the frozen Lentil Burgers (from the Frozen Vegan/Vegetarian section at the supermarket) when they were on special. Time Factor : EXCELLENT. Dinner ready to eat in 10 minutes. Complexity : LOW. Take patties out of freezer box, put in oven. Tricky. Deliciousness : MODERATE – EXCELLENT. Maybe I was just super hungry but this really hit the spot! Tummy Filling Factor : EXCELLENT. Comfortably full. Possum Friendly? YES. If she wasn’t being so fussy at the moment I would offer her something like this for dinner. She had her usual pile of mushrooms with some pasta and green peas instead. But burgers and patties make for a perfect baby led weaning meal or snack. This particular brand (Syndian) contains no scarey ingredients so I would feel quite comfortable serving these for the whole family. Would I make it again? Indeedy!